Calls for service and traffic stops were on the low side this past week. We handled 43 calls for service and conducted 23 traffic stops. Of those 23 stops 14 resulted in citations and 9 were given warnings. We had a few arrests this last week so that will at least give us some activity to report on. 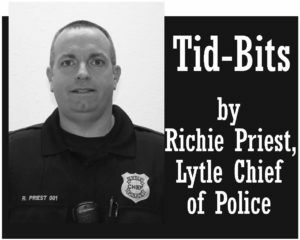 The first arrests were on Monday, a traffic stop on Diaz St. by Lt. Dear and Ofc. Pena resulted in the arrests of 3 individuals for possession of “weed”. Some other controlled substances were found as well as drug paraphernalia. They were all booked in to the Medina Co. Jail. On Wednesday, Sgt. Hanson arrested a fellow that pushed out about $800 worth of stuff from H.E.B. He had prior thefts so this one was an automatic felony. The fellow fled in his vehicle but was located just down the street at the Dollar General. He was shoplifting with his wife but I guess he forgot to tell her he was fleeing the scene. She was caught trying to leave H.E.B. with about $60 worth of items (she got a citation for theft). I have been to a few marriage retreats and always avoided the “Shoplifting as a Couple to Grow Closer” break out session. Now some people would say “maybe they were hungry” ok, well out of about $860 worth of items not one single item was edible. I’m not a shoplifter but I can guarantee you that if I loaded up a basket with $800 worth of stuff there would at least be a Snicker bar in there. On Saturday, Captain Reyes and Ofc. Antuna conducted a traffic stop on Main St. and found the occupant was “wanted”. He had an active felony injury to a child warrant out of Bexar Co. He was booked into the Atascosa Co. Jail. On Sunday, the dynamic duo also made a field contact on a suspicious vehicle and cited two occupants for possession of drug paraphernalia. The only property crime reported, other than the ones we had arrests on, was for the theft of a belt buckle valued at $259! This happened at Lynda’s shop in the 15300 block of Main St. Now that crook is going to be impressing people for sure at the rodeo this year. Last week I received an invitation to visit the Lytle Primary Campus and read a book to a class of 1st graders. We had a great time and I am sure the kids enjoyed it. It is obvious why I was selected, a lot of people (including my wife) comment regularly on my knowledge and usage of the English language.